InterMoor Australia, based in Perth, recently completed the first Quantitative Risk Assessment (QRA) project for a major Oil Company in Australia. InterMoor has supported their Client in assessing the risks of drilling in their field in Western Australia during cyclone season. The team has produced the data and the presentation for the Client’s risk assessment workshop and provided a final report incorporating the outcomes and recommendations from the workshop. InterMoor uses the MODU JIP Consequence Assessment workbook to develop and provide risk assessment data to clients and rig owners for consideration, starting from well permitting and approval process and continuing throughout all stages of a drilling campaign. 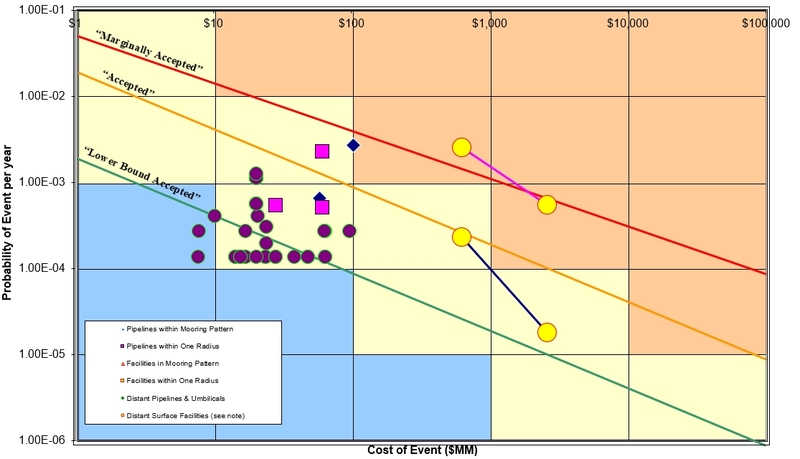 The MODU JIP Consequence Assessment workbook was developed by the American Bureau of Shipping’s consulting group (ABSG) for the MODU Mooring Strength and Reliability Joint Industry Project (MMSR-JIP) to categorize infrastructure, develop consequence of failure estimates, and provide risk data for consideration during risk assessment evaluations. The workbook was originally developed for use in the Gulf of Mexico and, in this case, has been adapted to the specifics of the project in Western Australia. “the challenge is to adapt a methodology that was originally developed in the Gulf of Mexico to local and unique Australian conditions and environment. We have been able to successfully overcome such a challenge due to our unique operational experience, that compares to no one else in the region, combined with the outstanding theoretical knowledge of our Engineers”. The Client’s feedback was that project execution and engineering output were above expectations.